Watch the exclusive Mr. Media interview with comedian and This Vs. That co-host Brad Sherwood and creator Jon Hotchkiss by clicking on the video player above! Mr. Media is recorded live before a studio audience of indecisive SOBs who can’t choose between folding chairs or couches with exposed springs because they don’t know which is more likely to hurt their butts in the long run… in the NEW new media capital of the world… St. Petersburg, Florida! Why is anything done in the manner to which we’ve become accustomed? For example, why do most airlines board passengers from the front of the plane to the back—or even the back to the front—whereas the most consistently profitable airline doesn’t assign seats and loads faster? Why is coffee most often served in Styrofoam cups when there are so many other options? 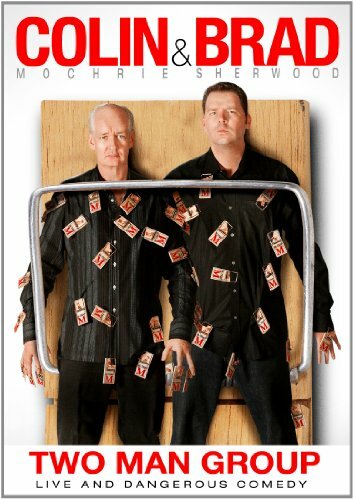 Order ‘Colin & Brad: Two Man Group,’ available right now at a great price by clicking on the DVD cover above! Why do a growing number of TV viewers retain news and information delivered with humor better than just a dry recitation of the facts? On This Vs. That, a new web-only TV series aimed at men via scientific method, the three co-hosts—friends Brad Sherwood, Mark DeCarlo and Chris Tallman—investigate science, urban legends and a bit of nonsense, always with a sense of humor and eye toward the absurd. • Which flotation is more likely to save your life if you survive a plane crash in water? Life vest vs. seat cushion?? • What’s the best way to get through traffic – stay in your lane or weave in and out?